My intention in starting this blog has always been to write about my life. I have started writing my life story multiple times and then stopped. Not sure why I stop, there are times I think my life really hasn’t been THAT interesting that it deserves to be in print. Then I realized I want to write this book because of all the interesting characters I have had in my life, the people who have made me who I am today, the choices I have made and learned by, the hilarity of life and the torture of it. The voices in my head that tell me to go on, push forward, forge ahead. The doubts in my head that tell me I am not worth it, never have been , never will be. I am not alone in this venture thru my life and I never have been, I have the voices of all that have been here before me reverberating in my brain, telling me what is right and what is wrong, why I am the way I am , why I need to change. That is all we are really, an empty jar to begin with, a clean slate, an untouched river. Everyone we have relationships with in our lives has something to do with who we are today. Our Parents, Our extended family, our friends, our lovers, the people we work with, the people we play with, our children, our Grandchildren. The people we connect to from the beginning of our lives and every moment in-between and all the way to the end.They are the ones that throw thoughts in our empty jar, write all over our empty slate and muddy up our untouched river. Some teach us the right things, some teach us the wrong ones. Some we know the reasons for the universe putting them in our lives right away, some it takes decades to figure out the lessons.My life story is not my own you see, it belongs to all of us and all of them. SO, in between my other ramblings in this blog I am going to share what I have so far written about my life. On that note from my archives of pages already written we begin. I moved five times from the day I was born until I was 17 years old. Not bad for a daughter of a self-proclaimed ” gypsy heart”, My Mother always said she should have been a gypsy but she gave up her belly dancing outfits and glass globe that peered in to the future for single motherhood and stability for us kids. She still dressed up as one for as long as I can remember on Halloween, she would put a curtain over the door of our apartment- and put her beautiful gold halter top on with her black pants and belt made of jingly coins , she would place a TV tray in front of her with a bowl of candy and a glass globe from which to tell her fortunes to the kids that showed up for trick or treating. Not that the five-year olds who showed up at our door had any clue who she was, or what she was saying, but I knew it was the one night of the year she got to be exactly who she had always wanted to be. She always said she got her ” gypsy heart from her Mother” who was much the same way, and her great Grandmother who moved every year from the time she was 18 until she was well in to her seventies and could not move anymore. I turned 17, and I moved: ALOT. In fact I have moved 21 times in the last 30 years, and am planning another in three months. People have one of three reactions when I tell them I am going to move again. The first : ” Where Now?” You know with that look on their face, like they have when they ask you to pass the butter at the dinner table, or you tell them your leaving to check the mail. Un- affected, a blank stare, your boring them with details- PASS THE WINE. The second: “AGAIN! ?” Please insert the following face: Wide eyes, terrified, like they are being chased by a tiger and they have a steak stapled to their mouth. They are utterly aghast at the words that just escaped from your mouth, so much so that they can’t even repeat them, they don’t even ask the normal questions that usually follow a statement like that, such as, Where? When? Are you excited? I am happy for you. I always wonder to myself why do they act this way? Is it because they truly can’t understand my need for a fresh start or are they secretly afraid one of these times I will ask them to help? The third: This one is a reserved spot only for my son. Because apparently when your born with me as your Mother, as soon as you are old enough to drive and own a truck, or borrow someone’s truck, or I can rent a truck. …you become my personal mover. It’s written in the fine print somewhere. When I tell him now;he gets a sheepish grin on his face, his color goes a sort of green tint and he quietly asks ” when.” When seems to the only question he is interested in as he knows he has to be free that day and most likely so does one of his good friends to help him. I can see his mind turning, he really doesn’t care about the reasoning behind it anymore, it is a normalcy for him now, I could be moving to china on a slow boat from hell, all he knows is he has to move the couch and somehow logistically now place all of my stuff in to an ocean container. 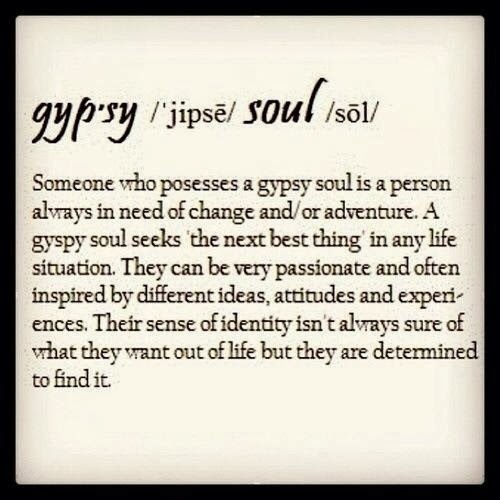 Ahhh, welcome my fellow Gypsy! I am glad you are here and I have someone that can relate!